In 2017 and 2018, the U.S. Food and Drug Administration (FDA) refused a total of twenty-seven (27) entry lines of Indian shrimp for reasons related to banned antibiotics. For these two years, Indian shrimp accounted for one out of every five entry lines of shrimp refused for banned antibiotics (27 out of 108). Yet, shrimp sourced from India accounts for more than one out of every three pounds of shrimp imported into the United States and the Indian shrimp farming industry is notorious for its failure to curtail the use of banned antibiotics in its aquaculture. 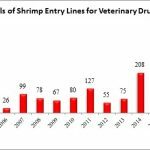 The low number of entry line refusals reported by the FDA regarding Indian shrimp imports over the last two years has been all the more disturbing given the public concerns voiced by other importing markets, particularly the European Union, regarding India’s inability to meaningfully address the continued presence of banned antibiotics in its shrimp exports. 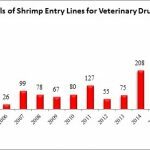 Last month, the FDA reported refusing twenty-six (26) shrimp entry lines for reasons related to banned antibiotics. All 26 were of shrimp shipped from India. These 26 entry lines represented 14.9% of the 175 total seafood entry lines refused in January 2019. 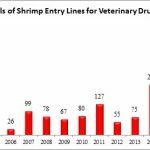 The 26 shrimp entry lines refused last month are roughly half of the total shrimp entry lines refused for reasons related to banned antibiotics in all of 2018. 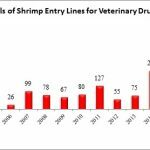 They represent the highest total number of shrimp entry lines refused for reasons related to banned antibiotics since August 2016, when the FDA refused 35 shrimp entry lines for antibiotics, of which 24 were from India. Further, as shown in the chart below, the 26 shrimp entry lines refused last month are equal to the total number of shrimp entry lines refused for reasons related to banned antibiotics in all of 2006. Kaylan Aqua & Marine Exports India (India), a company that is not currently listed on Import Alert 16-124 (“Detention Without Physical Examination of Aquaculture Seafood Products Due to Unapproved Drugs”), Import Alert 16-127 (“Detention Without Physical Examination of Crustaceans Due to Chloramphenicol”), or Import Alert 16-129, had two entry lines refused for shrimp contaminated with veterinary drug residues by the Division of West Coast Imports on January 2, 2019. In addition to the rejections of antibiotic-contaminated Indian shrimp, the FDA reported refusing another six entry lines of shrimp from India due to the presence of salmonella in January. These shipments were from three different Indian shrimp exporters: (1) Linus Agroventure Private Limited (three entry lines refused by the Division of West Coast Imports); (2) Paragon Sea Foods (two entry lines refused by the Division of West Coast Imports); and (3) Naik Seafoods Ltd. (one entry line refused by the Division of Northeast Imports).